Astronaut Tim Peake has reassured a concerned Prince Charles that he was doing extremely well after his six-month space mission. "Are you sure you're in one piece?" the Prince asked. Peake, 44, replied that he was "feeling absolutely great". The two met at the Bristol Centre of the Prince's Trust, which the Prince was there to unveil. 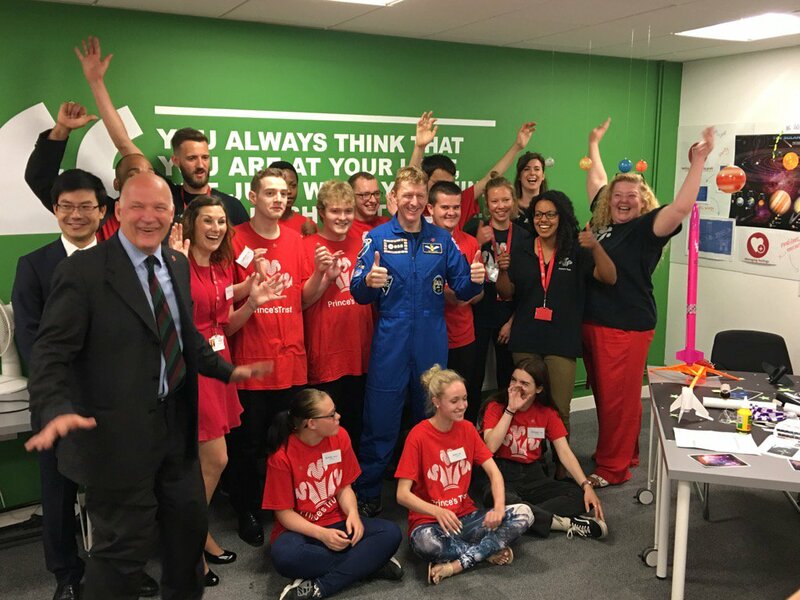 Father-of-two Peake has been an ambassador of the charity for over a year before he was launched in to space, and even ran the equivalent of a London Marathon for the organisation on a treadmill whilst orbiting the Earth. Major Peake spoke of the extreme temperatures and harsh impact (that of a small car crash!) his Soyuz capsule experienced upon re-entry to Earth. The Prince joked to surrounding young people that taking off in a rocket was "all right" but it was the "coming down" which was the problem. There's an element of risk with any space flight, so on the serious side it's nice to be back in one piece. The two then turned to the subject of the Prince's trust and it's mission to help disadvantaged young people. The Royal placed half the blame on the lack of workshops in schools, and said he found 'turning people's lives around' to be 'the most rewarding part' of his work. Daniel Edmund, 19, who has experienced depression, credits the trust for helping turn his life around. He now has a job as a trainee outdoor activity instructor. "I wouldn't be here without the Prince's Trust," he said. The astronaut paid tribute to the Prince and his trust for helping "825,000 young people" change their lives for the better. He called Charles "a wonderfully inspirational man" and later tweeted that it was an "honour" to meet the future king. Prince Charles appeared equally impressed with Major Peake, describing him as "brave".